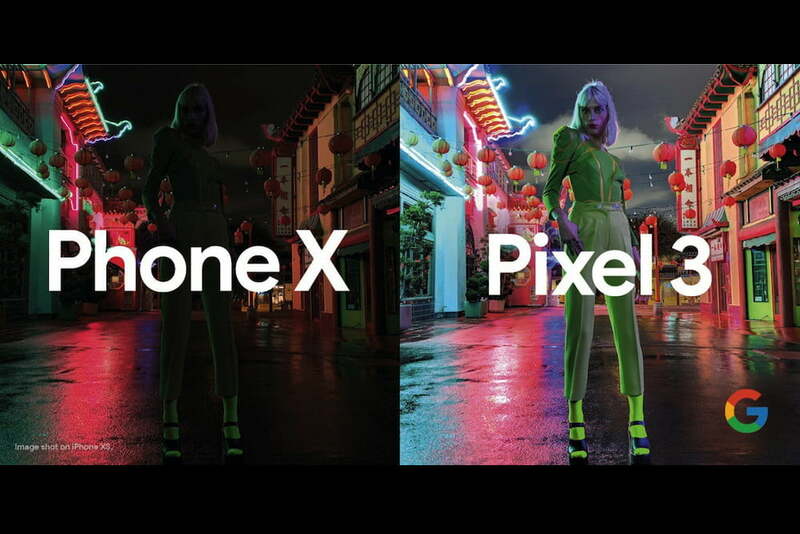 Google vice president of marketing Marvin Chow has sparked debate on Twitter after sharing an image comparing the cameras on the Google Pixel 3 and the Apple iPhone XS. Rather than a shot of a dramatic landscape, or a bokeh-filled portrait, the picture is of a low-light street scene, and demonstrates the difference between the iPhone’s camera and Night Sight mode on the Pixel 3. The controversy comes from the considerable difference between the two, and whether one is really “better” than the other. Chow writes in his tweet, “Night Sight on the Google Pixel 3 — pretty much speaks for itself,” and adds an explosion emoji to indicate the photo’s supremacy over the iPhone, in his humble opinion. Looked at quickly, the Google Pixel 3’s Night Sight shot reveals more about the scene, including the female model’s clothes and facial features, but it takes on an almost hyper-real look. Without being present when the photo was taken, it’s impossible to know what it really looked like at the time, but it’s hard to imagine the scene looked like this to the naked eye. The iPhone XS’s photo shrouds the model in shadow, with moody lighting behind her from the neon signs, potentially making it more realistic. Both are very different photographs. Why? The Google Pixel 3 uses Night Sight to take its photo, a special camera mode that combines the HDR+ mode with some artificial intelligence magic to boost the colors and brightness in low-light photos. (Read our complete guide to Pixel 3 photography for more info.) The results aren’t always as instantly dramatic as the one shared by Chow, but are rarely anything other than visually impressive. The controversy comes from just how different the two are, and whether the Night Sight photo really is an improvement over the iPhone’s photo. Replies to Chow’s tweet and picture include complaints about Night Sight’s tendency to over saturate and overexpose a shot, and to introduce noise following aggressive software enhancement. We noted in our Night Sight launch story that it can, “Strip away the ambiance or mood of the image,” and some may feel this is what has happened in the example image shared on Twitter. The iPhone does not have a similar mode, and the Smart HDR feature introduced on the iPhone XS does not affect low-light images. The Pixel 3’s picture looks astonishing, however, and would be the image most would instantly share online. The iPhone XS’s picture requires some editing to make it more shareable. Both have their merits and downsides. Which do you prefer?